Our team's weekly challenge was to create a project using the colors Pool Party, Daffodil Delight, Pacific Point, and Crumb Cake. I must admit the new " Graceful Glass DSP is my favorite designer series paper in the new catalog. I love being able to let me creativity flow while coloring this DSP. 1. Cut Pool Party card base 8 1/2" x 5 1/2" and score @ 4 1/4"
2. Cut Pacific Point card stock 3" x 3"
3. 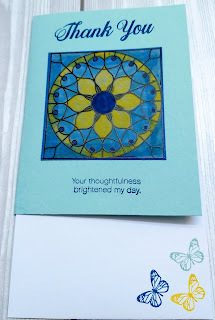 Color the desired vellum image using the stampin write markers. 4. Cut out the colored vellum image. 5. 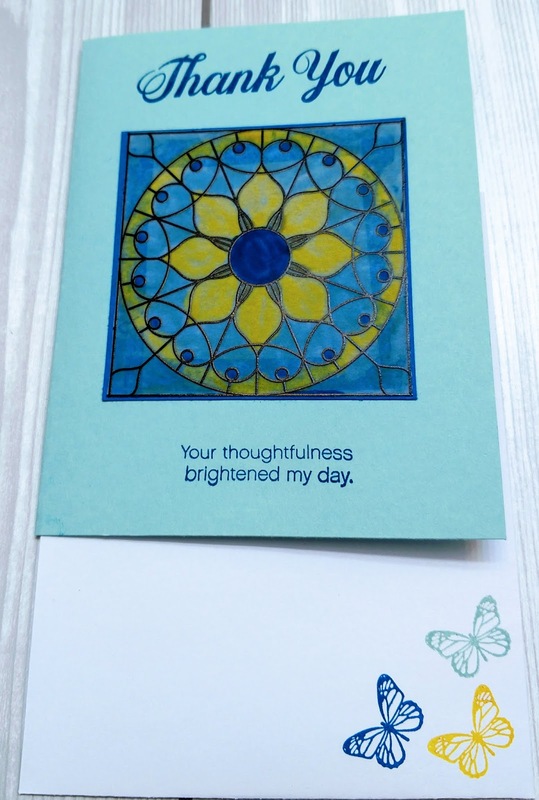 Attach the colored vellum dsp to pacific point card stock using snail adhesive. 6. Attach vellum layer to card base using snail adhesive. 7. Stamp sentiments from Daisy Delight Stamp set using the Pacific Point ink pad. Voila your card is complete! CODE: CVAAD3ZB to receive the new cleaning tool, "Simply Shammy".